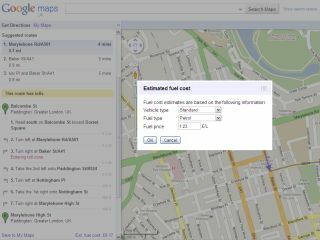 Google has snuck out a new feature on Google Maps which calculates the approximate fuel cost for your journey. Using the Get Directions feature, once your route has been calculated the estimated fuel cost appears at the bottom of the list. From London to Bath in a standard car you're looking at £19.85 according Google, which uses a third party to pull in actual fuel costs. You can change the fuel type from petrol to diesel, as well as customise what type of car you drive, depending on whether it's a high consumption, standard or compact model. It's not clear yet whether or not the feature is available on the Google Maps Navigation app for Android, but it hasn't made an appearance on the iPhone-optimised version as yet. Either way, it's quite a handy little addition to the desktop edition, and one that Google has kept strangely quiet – we would have thought a quick blog post about the environment and rising fuel costs and whatnot would have been right up Google's street.